Fantasy Flight Games knows how the holiday season can drive you crazy... and they're here to help!... drive you crazy-er, that is. 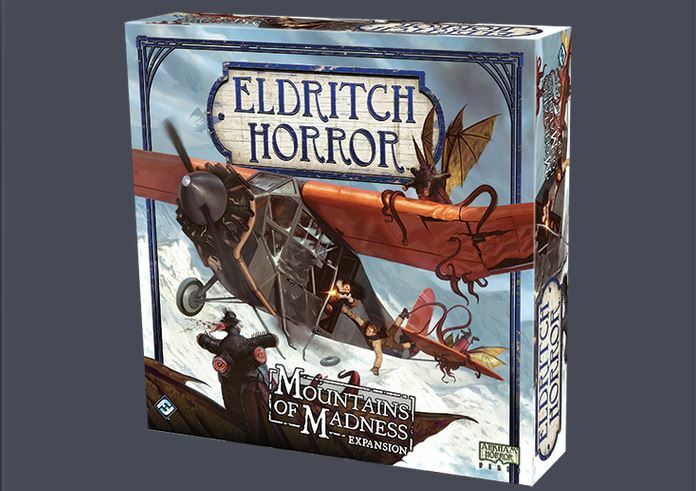 The Mountains of Madness expansion set for Eldritch Horror is now available. Researchers must head to the poles (yes, there's a North Pole adventure along with all the shenanigans happening in the Antarctic) to save humanity from the likes of Ithaqua and the Rampaging Shoggoth. They must overcome otherworldly hunger and hypothermia to do it, too! It's not going to be easy. So be sure to pack a couple extra pairs of socks and your good thermal underwear, 'cause baby, it's cold outside. Mountains of Madness, the new side board expansion for Eldritch Horror, is now available at your local retailer! A Misktaonic University expedition to Antarctica has discovered prehistoric ruins and encountered inhuman, bloodthirsty creatures. In Mountains of Madness, investigators follow that expedition's trail and search Antarctica’s icy expanses for the clues needed to save humanity from the awakening Ancient Ones. In addition to the side board depicting locations throughout Antarctica, this expansion features two Ancient Ones and eight investigators who are willing to sacrifice their lives and their sanity to save the human race. These brave souls are aided by plenty of new Assets, Spells, and Artifacts as they search for clues and battle not only monsters, but harsh and deadly conditions across the globe.